I have used buckwheat grout for oatmeal, tomato sauce, vegetable soup in the past few months. The other day, I decided to make corn soup for dinner and got an idea to put some buckwheat into the soup. I boiled the buckwheat grout for 15 min. 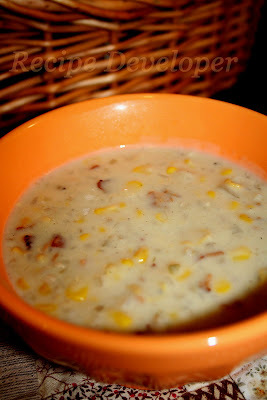 and then added it to the soup at the same time when I put the corn, (one whole can and cream style one). Then, I used some flour to add some thickness to the soup, at the same time, the buckwheat gave a nice consistency at the end. I prefer to put some consistency to soup with flour instead of using corn starch. Canned Corn・・・・・・・・・ 1 lb. each of whole and cream style. All Purpose Flour・・・・ 5 tbsp. 1.) Cook bacon until it gets crispy, add onion and saute for 5 min. with medium-low heat. * If you don't want to use all the bacon oil, you can take it out and add 4 tbsp. of Canola Oil instead. 2.) Add some flour and cook for 5min. Add soup stock, corn, and buckwheat. If you like, you can add some dried herb at this point. 3.) Simmer for 15 min., and add milk or half & half. 4.) Taste with Salt and Pepper. With nice crusty bread, mmmm.............yummy!